Early hockey remained mostly outdoors — the first organized game was played in Montreal’s Victoria Skating Rink in March of 1875. The venue shaped the game from the start. The dimensions of the ice they played on that day — 80 feet by 204 — set the standard for the surface that the NHL uses to this day. To save the spectators and the windows, a puck was used that day, too, for the first time, in place of a rubber ball. Does it surprise anyone that the proceedings ended with a fight? The first purpose-built hockey rink in the country was Montreal’s Westmount Arena, which opened in 1898. Hockey was growing in popularity, and the old buildings weren’t big enough to accommodate the crowds that wanted in. Take a note of the nomenclature, if you would: the Westmount was an arena rather than a rink. 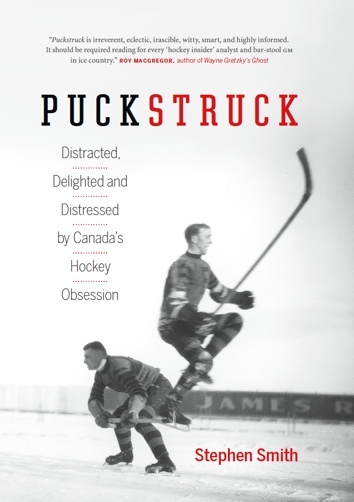 Hockey wasn’t just a game you played with your friends any longer, it was spectacle now, and increasingly builders and owners and impresarios were thinking about ways to attract spectators and — all importantly — to convince them to spend their money. 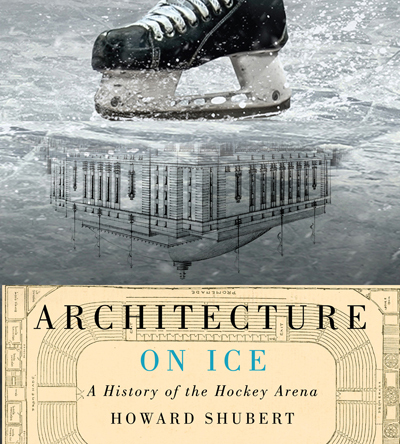 In tracing this evolution, Architecture On Ice ranges across the map, to early English rinks with their artificial ice, and (at length) across the United States. Shubert lingers on the building boom south of the border in the early years of the 20th century, turning a fine, fascinating focus to what he calls the dialogue between sport and architecture without which professional hockey never would have been able to take root in New York and Chicago let alone (later on) Anaheim and Columbus. Along the way, he talks urban revitalization and the role of public financing of private arenas; celebrates the expressive, even poetic form of several West Coast U.S. arenas that went up in the 1960s; visits with the beloved American tradition of tailgate parties; pauses to consider the effect The Beatles had on audiences; thinks about Canadianness and Jumbotrons and cheerleaders on skates. Hold on, though: Shubert has worse tidings. Hockey got bigger in the late 1960s, which is to say that the NHL expanded, and for all the virtues of that, new markets and new fans, it was the beginning of the end for hockey’s arenas. We’re in the age now of what Shubert dubs the corporate-entertainment complex. The hockey arena hasn’t vanished so much as it’s been swallowed, “reduced to a space” wherein no single attraction can be allowed to define the identity of the space. What owners want now are “generic, shape-shifting, ‘no places,’” Shubert writes, hubs for development. And so here we are: in the early years of the new century, hockey is just another tenant in the arenas it used to own. Oh, and did I mention that they’re not arenas any more? Hockey’s professionals ply their trade in Centers now, and Places, with corporations lining up to pay millions of dollars for the privilege of naming them, which is how we end up in buildings called Pepsi and Bell and Canadian Tire. Some NHL venues still may call themselves Arenas, but be careful, they’re lying to you. Is this a time to bemoan what’s been lost, then, to keen for the past? If you’re a fervent fan of the New York Islanders the answer might be yes. Last season was the teams’ first in the Brooklyn’s Barclay Centre following a move from their long-time Long-Island home at the Nassau Veterans Memorial Coliseum. Before the last game had been played at the new facility in the spring, rumours were rife that the team was trying to escape its lease and leave the fan-unfriendly sightlines and wander elsewhere in a search of home, maybe to Queens or even back to Long Island. It’s enough to break your heart, as a hockey fan. We’re a hardened bunch now, though, aren’t we, after all that we’ve seen? We’re past worrying that our national winter pastime has been reduced by the corporatization of the game, or that our affection for it, and our memories, might be at risk in this age we’re in. Aren’t we? Howard Shubert doesn’t share strong feelings on any of this — or maybe he feels it’s beyond his brief. He does offer a word of … solace? Religion, he points out, is in decline, too, replaced by a deeper interest in wealth and consumption, you see churches being deconsecrated and repurposed all the time, so … not … to … worry. I had some of these questions in mind one midweek afternoon during September’s World Cup of Hockey as I went down to watch some of the hockey at Toronto’s Air Canada Centre. The weather wasn’t really in the mood, and the city still had most of its downtown attention fixed on baseball’s Blue Jays and their run for the playoffs. Still, Finland was playing Russia with a place in the tournament’s semi-finals at stake, so I bought a ticket. I’d thought about stopping in on the way to the game at the Potemkin Village that the NHL had up and running during World Cup week, offering — sorry, my mistake, a little slip there, it was actually the Scotiabank World Cup of Hockey Fan Village. Anyway, I didn’t go. I headed straight for the game. I was on my own, which I didn’t mind, since I had work to do, involving careful watching of just how we were inhabiting that air-conditioned space. My report: we were dressed up in Finnish blue and Russian red, with many fun accessories, including fur bonnets and small stuffed bears (Russians) and yellow sou’wester fisherman hats (Finns). We bought $14 beer and, because we were more than a little hungry, we thought about ordering a $16.25 sushi burrito. The ACC announcer, who was loud and very chipper, told us to post our photos on social media and don’t forget the hashtag (don’t remember what it was). “Fans!” he called to us, imperatively, when he wanted he wanted our attention, so we knew how important it was that we listen up. The music was loud and Top-40, it shook us in our seats, and the lights were bright, for TV, illuminating us to the point that we felt a little like we were inside our TVs, which I guess we were — anyway, we felt very garish, exposed, as you do when you’re at risk of an errant puck flying off Henrik Sedin’s stick and smacking you in the temple. We worried, too, about what to do if the camera found us and beamed us up onto the big screen over centre ice, would we wave to ourselves, or pretend we weren’t aware, or … dance? It was exhausting, with so much corporate concern focussed on every one of us in the building, are you sufficiently entertained, need another beer? Commodified relics were available in the concourse: “Own a piece of history,” the announcer commanded — vials of melted World Cup ice were on sale, he wanted us to know, a huckster of holy water. It was difficult, too, to remember not to watch the ginormous screen above the ice as the real live hockey swirled directly in front of me. We felt bad for the Finns, who kept hitting posts. We held up signs (I’m Skipping School To See You, Ovie! ); some of us hoped to assist Finland’s ESSO-sponsored powerplay by screaming at it. It was a good game. I won’t say that I was actively searching the upper reaches of that non-arena for anything other than the score of the game. All I’m saying is that on that day, as the Russians pressed their advantage and went on beating the Finns, whatever ghosts usually reside in the rafters at the ACC seemed to have left the building. I don’t know whether it’s a permanent situation or not, but be advised that if you’re headed there anytime soon, it might be a good idea to bring your own, just in case.